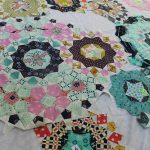 After I mentioned some tips on keeping your quilts looking good, Suzanne asked what to do with a quilt that has had an awesome, exciting life that has left it looking less than awesome. For example, my mom made me a quilt with a big D for Dana in the middle of it. 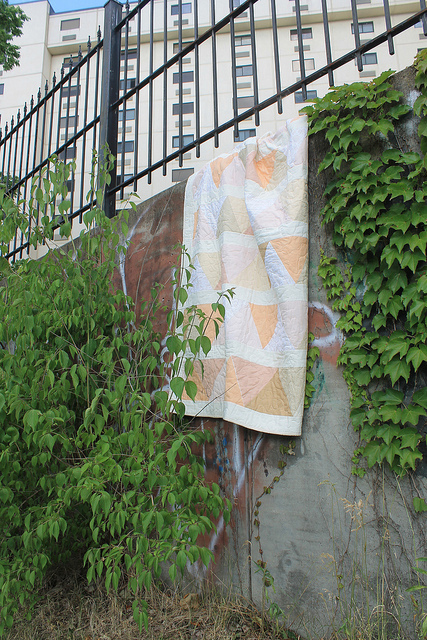 I slept with it and had picnics with it and left it in the rain until it was more a tangled thread than a quilt. This is very tragic. I have deemed my D quilt un-salvageable, so alas, it’s respectfully folded in a cotton sheet in a box at my dad’s house. 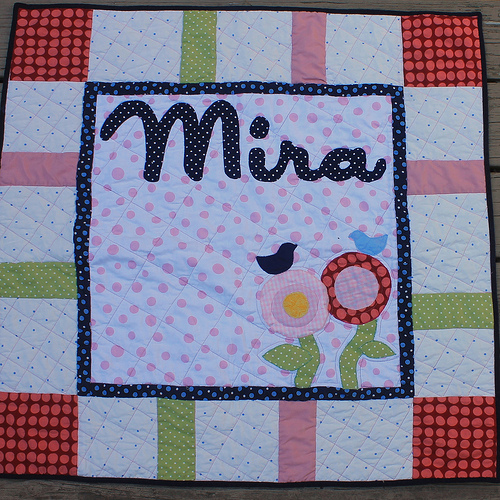 I think the way to make this one live forever is to make new quilts for kids with the letters of their names on them, so that they can have the same narcissistic thrill of loving and eventually destroying their own personal quilt. The quilt pictured above is a quilt I got at a yard sale; you can see the fabric is so thin you can see through it. Though I didn’t have the pleasure of destroying it myself, it’s very dear to me. If I ever do any repairs to it, it would be to re-bind it with fabric from an old, worn cotton sheet, since the edges are fraying. I think if I used new cotton to re-bind it, it would look bad. Any repairs to the appliquéd flowers I could make would just make it look ridiculous because how could I match the color and wear and feeling of that fabric? It can’t handle the wear and tear of being used daily, but I put it on the spare bedroom in the summertime, because it is so summery and happy. There are different ways to love and remember and heal the quilts in our lives. The first step is definitely preventing damage. 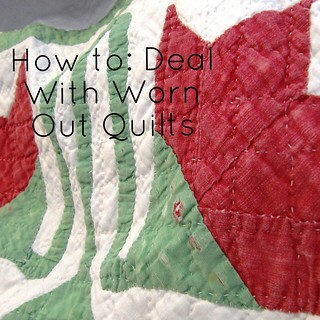 There aren’t a lot of great resources on fixing quilts, and many of them are very expensive. Here is one of the better ones I’ve found. The first thing is to make a list of what needs fixed – a hole, frayed edges, batting bunched up, one particular fabric has worn out but the rest are fine, etc. The other key thing is to look at the quilt for stuff that is about to break. 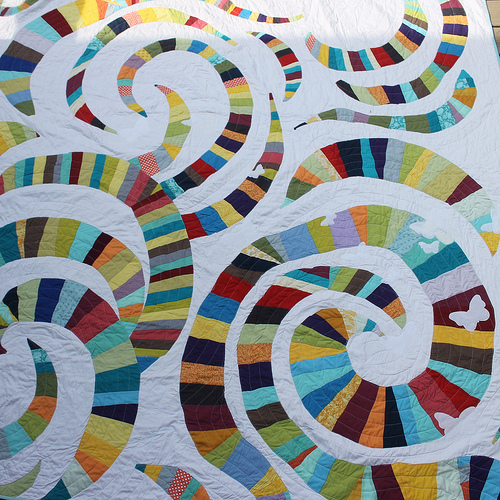 Consider: What do you want this quilt to do? How strong and durable does it need to be to do those things? 3. Spending hours and hours hand stitching up one part of the quilt only to have another aspect of the quilt disintegrate a month later. 4. 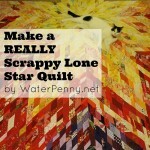 Washing a quilt with anything fraying or damaged on it. (Hand-washing is probably fine?). When you patch anything, the fabric you are patching it with is going to be stronger and heavier than the thin fabric, which can tear at it. Does that make sense? Whenever you sew a heavier fabric to a thinner one, you are putting a lot of stress on the thinner fabric. Similarly, you don’t want to use a really heavy thread, because that does the same thing. If your fabric/quilt is really rough, one option is to pull the quilt apart and apply fusible webbing to the back to stabilize the fabric. I prefer Pellon Wonder Under. 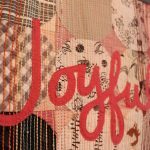 Once you have stabilized the fabric, you can put it back together the way it was, or use the salvaged pieces to make a memory quilt – a new design that incorporates the old quilt with new fabrics, or maybe even adding old clothes or fabrics from when you were growing up to repair the quilt! I have also seen quilts cut up and framed for wall-hangings, or re-made into placemats, fabric baskets, etc. Better to admire what you have left than let moths eat it in a drawer. One of the best things I’ve ever seen done with an old quilt was to cut it apart and make a new quilt. I know that sounds odd, but the “strongest” pieces were backed with fusible webbing and saved and incorporated into a new quilt.